You’d think that with all the whining about things like defensive shifts (which aren’t as shifty as you’ve been led to think), bullpenning (They think we never done anything before we done it—Casey Stengel), and the ridiculous unwritten rules, continued, that baseball in 2018 sometimes seemed about as much fun as undergoing root canal with no anesthetic. And you’d be thinking wrongly. 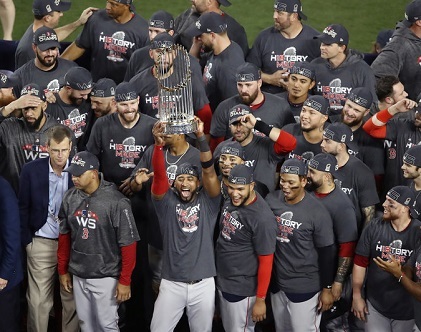 * The New Boston Massacre—It happened in early August, when the Red Sox swept the Yankees in a four-game set, four decades after the Yankees battered the Red Sox to get back into the American League East race. And it continued in the postseason, after splitting two division series games in Boston with Aaron Judge blasting “New York, New York” on his way out of Fenway Park. Losing only one game each in all three postseason sets gave the 108 game-winning Red Sox—with the unlikely Steve Pearce the World Series MVP, with Mookie Betts winning the AL’s Most Valuable Player award, and with Andrew Benintendi making the catch of the season to save a Red Sox ALCS win and probably their season while he was at it, among other individual conquests, not to mention David Price burying his former reputation as a postseason bust—their fourth World Series triumph of the new century. Bote’s blast closed the coffin lid on the Nationals’ 2018; it wouldn’t be long before the nails were hammered in. It may have been the second most dramatic home run of the year, behind Max Muncy’s game-ending blast in Game Three of the World Series . . . in the bottom of the eighteenth inning. And, just ahead of Betts’s July epic against the Blue Jays, when he ended a thirteen-pitch bottom-of-the-fourth at-bat against J.A. Happ with a salami. (Assist to Jays first baseman Justin Smoak, who ran down a 1-2 foul pop and had it bound off his glove to keep Betts alive early.) Betts was so jubilant after he hit the ball—knowing at once it was going out (and I mean out: it flew over a sign at the back of the Green Monster seats and out of Fenway Park entirely)—he almost tripped over himself up the first base line running it out. * Manono—In April, Sean Manaea threw the Athletics’ first no-hitter since Dallas Braden’s perfect game on Mother’s Day 2010. It made the Red Sox—with an .894 winning percentage at the time—the best team ever to be no-hit. It was 2018’s first no-hitter, and Manaea enjoyed the double treat of being interviewed on the field post-game by Braden himself, now working for NBC Sports California. But Manaea’s season ended for all intent and purpose in August when his shoulder began to bark. Come 19 September: arthroscopic surgery to repair a shoulder impingement, sending Manaea down for the count until after the 2019 season. * Float like a Seaver, sting like a Schmidt—The Angels won the comparatively modest sweepstakes for Japanese two-way player Shohei Ohtani. After making a critical adjustment near the end of spring training, Ohtani won the American League’s Rookie of the Year award based on his mound and plate work. His signature moments: 1) Shaking off a three-run first to punch out twelve A’s in his first start. 2) Hitting three home runs in two days, against the Indians and the A’s. The only major leaguer before him to hit 20+ home runs and pitch 50+ innings in the same season? Some bum named Ruth. * This One’s for Mom—A’s outfielder Stephen Piscotty was traded there from St. Louis after 2017 so he could be closer to his ALS-stricken mother, Gretchen. She lost the battle on 6 May 2018. After taking one day off and returning with a base hit his first time up against the Astros (pitcher Lance McCullers politely stepped off the mound to let him bask in the ovation), Piscotty left the team on bereavement leave. He returned to the A’s in Boston two days after his first Mother’s Day without her. * One for the Records?—Baseball’s going to miss Adrian Beltre, who retired after the season and now awaits his election to the Hall of Fame in five years. (Bank on it.) But he went out the same way he ended his seven previous seasons. I don’t know for sure if this is a record for petty crime, but Beltre stole exactly . . . one base each in his final eight years. The Man of Steal he wasn’t. * Valdez is Coming—According to Jayson Stark of The Athletic, it took 92,000 major league pitching starts by almost 1,600 major league pitchers to do in the entire 21st century to date what Astros rookie Framber Valdez did in back-to-back 2018 starts: equal pitching lines in two starts each of five innings pitched, two hits, one earned run, three walks, and three strikeouts. This is what you call consistency. We think. Cushman also points out that the Empire Emeritus could, in theory, go the entire length of the deal without winning a World Series with Machado under contract, if they end up winning the Machado sweepstakes, while the Olde Towne Team won the 2018 World Series despite still paying off on Pablo Sandoval’s deal. * Jacob’s Ladder—The Mets looked even worse giving Jacob deGrom grounds to sue for non-support than the Mariners did with Felix Hernandez eight years earlier. How very Mets it was that deGrom pitched like a combination of 1965-66 Sandy Koufax, 1968 Bob Gibson, and 2000 Pedro Martinez, and the Mets treated him like the late Anthony Young, almost: deGrom had only ten wins to show for a performance that should have gotten him a 22-9 record at minimum. Cy Young Award voters looked at his 1.70 ERA, his 1.97 fielding-independent pitching (once again: that’s your ERA when your defenses are removed from the equation), the sub-.200 batting average against him, his wins above a replacement-level player at any position (10.0), and that he was only the second pitcher since earned runs became an official stat (in 1913) to have an ERA under 2.00, 250+ strikeouts, and -50 walks in the same season, and voted deGrom the Cy Young winner with 29 of 30 possible first-place votes. This made for the fourth Cy Young Award by Mets pitchers, and this time the Mets did everything in their power to prevent it. * Urena Crock—Nobody could stop the National League’s Rookie of the Year, Atlanta’s Ronald Acuna, Jr., from destroying baseballs, but Miami’s Jose Urena picked the absolute wrong way to try . . . after Acuna spent the first three games of an August set a) hitting one bomb in each game of a doubleheader; and, b) hitting two bombs in the second game of the set. Leading off in the bottom of the first of the fourth game, Acuna took one on the elbow from Urena, on the first pitch, with malice aforethought. It brought the Braves pouring out of their dugout and a lot of questions as to why plate umpire Chad Fairchild delayed ejecting Urena. Then, as Acuna continued shaking the pain off, the benches re-emptied after Braves manager Brian Snitker—justifiably—remained in a rage over why Urena had yet to be ejected from the game. At long last, he was. Bizarrely, so was Snitker. Urena ended up suspended six games. It should have been six starts. Hall of Famer Willie Stargell once said, “The umpire doesn’t say, ‘Work Ball’.” I said then and still believe now: you want to work ball, play the game in a business suit. This game’s still supposed to be fun. OK? Re: MLB 2018: This game's still fun, OK? Looks like Framber Valdez will be needed, with McCullers having Tommy John surgery, and Kuechel opting for free agency. More likely our highly touted prospects JB and Whitley will be needed. Unless Luhnow somehow pulls another rabbit out of the hat. I figure all 3 will get a look during spring training. I continue to add my prayers to yours that someone will do the bazooka bat thing. Decent wrap of the year, @EasyAce! '19 probably isn't going to be much fun for the fans of the desert Snakes, but we could see it coming all year, what with Player's contracts running out and such. Neither will be missed by me but I'm a crochety ole guy to begin with.